Omis, where river meet the sea – located in the heart of Dalmatia, a small town and a harbor situated on the Cetina river, around 25 km south from Split and 40 km from Makarska. Thanks to it’s location, the town has good connections with the rest of the world through the airport of Split, and through a new and modern highway. After you’ve reached Split, a regular bus line can take you to Omis pretty fast. The famous destinations of Croatia, such as Dubrovnik or Zadar are not to far away for you to visit, around 2 to 3 hours in each direction. The Mirabella Fortress (Peovica) was built in the 18th century as a good place to retreat and hide into safety for Omis pirates. It can now be climbed up with the stairs and seeing a church of the Holy Spirit along the way,taking around 15 minutes to get to it. Other medieval fortresses to visit in this riviera are the Fortress Starigrad, Visuc and Zadvarje. There is also a number of churches in Omis. The Church of St. Michael represents a mixture of Gothic, Renaissance and Baroque style, and one of Omis’s most important architectural achievements. The Renaissance Church of the Holy Ghost that was built in 1585. on what was left of an older, gothic church. The Church of St. Peter Is well preserved to these days and it is a rare Pre-Romanesque building bulit in the 10th century. Other examples are the Church of St. Luke, the Church of St. Roch,the Church of St. Mary and others. This Riviera is also filled with a number of beautiful pebble and sandy beaches. The largest one is the sandy public beach in Omis, called simply the Big Beach, stretching for almost a kilometer, with its shallow watter being suitable for families with young children, but there is an variety of other activities to engage in, as well as some cafes or restaurants to relax in. Other destinations known for their fabulous pebble beaches nearby are Nemira, Stanici, Lokva, Rogoznica, Medici, Marusici and others. The landscape of Omis Is truly remarkable, going from the Adriatic Sea, to the Cetina river canyon and the mountains Omiska Dinara and Mosor in the back, Omis is really a place to admire. All of this contributed to making Omis a place that is overflowing with activities for you to choose from. 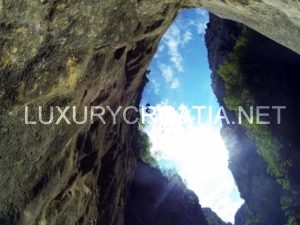 Some of these include rock climbing or hiking, rafting and kayaking in the Cetina river, cycling from Omis to Radmanove mlinice, paragliding, diving, zip- line and so on. The cuisine in Omis is characterized by the Dalmatian traditional flavors. Their food is super light and healthy, with an essential addition of olive oil, you are sure to see the locally grown fruits and vegetables, fish from the river and the sea, meat and lamb prepared under the peka with potatoes and other specialties, seasoned with aromatic herbs. In Omis area, make sure to try the local Soparnik, one of the favorite snack of the locals.